Judging by these spy photos, it appears that Ram Heavy Duty pickup trucks could soon reduce nitrogen-oxide emissions using the same urea-based NOx scrubbing technology that’s found in Ford, General Motors and Ram 4500/5500 commercial chassis cab trucks. NOx is a major air pollutant that contributes to smog, asthma and respiratory and heart diseases. It’s a byproduct of diesel’s high combustion temperatures, which results from the high frictional heat levels created by compressing air in the cylinders to the point where it can ignite diesel fuel without using a spark. This is unlike a gasoline engine, which uses spark ignition to burn petrol. 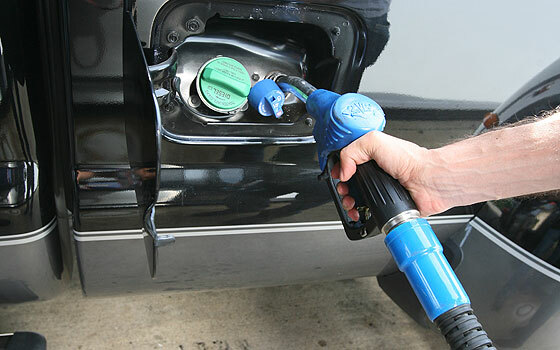 Since 2010 when emissions standards became much tougher, Ford and GM have used selective catalytic reduction with so-called Diesel Exhaust Fluid in their heavy-duty pickups. The urea-based solution (32.5 percent industrial urea and 67.5 percent deionized water) is held in a separate storage tank and injected as a fine mist into the hot exhaust gases. The heat turns the urea into ammonia that — when combined with a special catalytic converter — breaks down NOx into harmless nitrogen gas and water vapor. In 2007, Dodge introduced a different approach to NOx reduction that’s still in use today. It combines exhaust gas recirculation (used to cool combustion temperatures and reduce NOx) plus a special “adsorber” catalyst material to soak up and break down remaining NOx molecules before they leave the tailpipe. Each approach has its benefits and drawbacks. SCR requires periodic maintenance to refill the DEF tank approximately every 7,000 miles or the truck’s performance will be reduced per federal guidelines, but it also helps improve fuel economy by reducing EGR, allowing the diesel to operate in a more efficient range. A NOx adsorber operates without any maintenance required by the driver (something highlighted in Ram’s advertising efforts), but it depends on rare earth metals such as rhodium or palladium that are much more expensive than urea. An adsorber is also less fuel efficient than DEF because it requires the engine to run cooler than optimal operating temperatures (to inhibit NOx formation). The adsorber periodically requires small amounts of diesel fuel to be used to “regenerate” the adsorber surface to clean it of sulfur from the fuel, which can reduce its effectiveness over time. 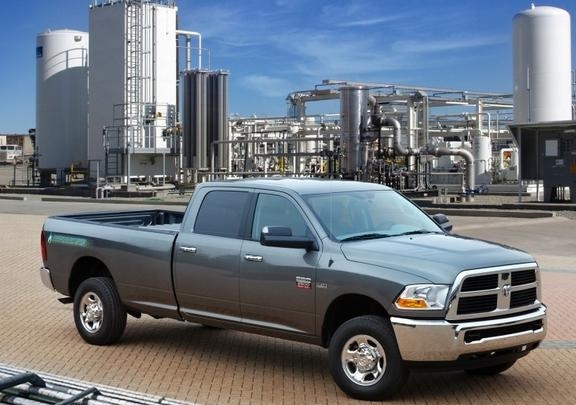 For 2010, Ram trucks introduced DEF technology in its 4500 and 5500 medium-duty chassis cabs, which helped the trucks claim best-in-class fuel-economy numbers, according to Chrysler. It appears this system will be introduced on its HD pickups. The photos show what appears to be a DEF reservoir hanging below the second-row seat of this Ram 2500 HD; it’s in the same spot where the DEF tank hangs below the chassis cabs. It’s also positioned on the outside of the frame rail, so we can be sure it’s not an extra fuel tank. The tank also appears to be about the same size – eight gallons — as the Chassis cabs’ tank. By moving to DEF on the Ram 2500 and 3500 HD pickups, we’d expect to see an improvement in fuel economy, making the change worthwhile to owners. Ram executives have also said they expect DEF technology to be familiar to HD pickup owners over the next few years.